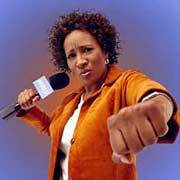 After Wanda Sykes earned her B.S. in marketing at Hampton University in Virginia, she found herself working at the National Security Agency. In 1987, she performed standup for the first time in front of a live audience at a Coors Light Super Talent Showcase in Washington, DC. Later she would periodically open for Chris Rock. Rock later hired her for a five-year stint writing and appearing on The Chris Rock Show, for which she earned an Emmy. Decades later she would appear in forgettable flicks like Pootie Tang (described by Roger Ebert as "not in releasable condition") and Nutty Professor II: The Klumps. In her FOX sitcom, Wanda at Large, Sykes briefly played Wanda Hawkins, a struggling stand-up comedian hired as an on-air correspondent by a Washington, DC, political talk show. She appeared opposite actor Phil Morris, who played attorney Jackie Chiles in the final seasons of Seinfeld. The show was cancelled after a season and a half. Sykes' writing credits include The 1999 MTV Music Video Awards and The Keenan Ivory Wayans Show. In 2001, she won the American Comedy Award for Funniest Female Stand-Up Comic, but was criticized by Bill Cosby for her loud and sassy finger-snapping, jive-talking go-go-ghetto-girl antics at the 2003 Emmy Awards. She squawked at Cosby, asking him if The Cosby Show was all scripted. Cosby, an outspoken critic of noisy black comics, snubbed her on camera with the reply, "Yes, we spoke English." Sykes has since risen to further prominence with her skeptical, insightful standup comedy and well-received appearances on Larry David's Curb Your Enthusiasm. "I'm proud to be a woman. I'm proud to be a black woman, and I'm proud to be gay."